Family is a group of people who have special meaning in our lives. They are the backbone of support, personal cheerleaders, teachers, counselors, and anything else we might need. Do you know the divorce rate in the church now almost equals the rate for non-believers? Just think how many children are growing up in two homes and perhaps more if their parents re-marry. As they wander from home to home, what identifies them as a family? Something needs to. Being part of a family connects you to others, in what should be an unshakable bond. So when we talk about family identity, we are wondering what unifies a family into one. How do you build unity into your family? One way is to build spiritual unity by praying together as a family and serving God together. Here are a couple ways you can do this. Have a ‘key verse’ your family uses to base its actions on. This can change over the years as the needs and age of your children/family change. In our home the key verse was Mark 12:29-31. Have family devotions. Parents all too often see family devotions as one more thing to fit into an already busy schedule. We carry family devotion books for children of all ages in the Parenting Made Practical bookstore. You will find you can read the Bible passage and devotional thought plus ask the questions at the end of the devotional and be done in 10 – 15 minutes. If you have never had family devotions before, start with one day a week and read the devotional right after dinner while everyone is still sitting at the table. Another way to build unity into your family is through emotional support, which a family needs for its members to be intertwined with each other. Emotional support includes being there for each other and lifting each other up. Be encouragers (I Thessalonians 5:11) To encourage is to “give courage to.” We love that. When someone in the family is faltering or nervous about trying something, there is nothing like your family standing behind you giving you the courage to take the first step. Be positive. Being positive starts with our tongue. Sarcasm, harsh tones, and the like spread like wildfire in a family and soon everyone is focused on the negative instead of the positive. When he was in elementary school, our son would come home from school full of negative stories. I(Carla) told him he had to tell me 3 good things for every bad thing. This helped him think of the positive about his day and he would actually look for good things to share. After being in youth and family ministry for over two decades, we can tell you when a teen is strong in his personal convictions and moral value system, when he knows he can count on his parents for support and encouragement, when home is a place of stability and security, when he knows he can count on his family for fun – he is less likely to look for any of those anyplace else. This will keep him strong in his faith, and make him less vulnerable to temptations that other teens face. What about your family? What would your children say is special about being a part of your family? 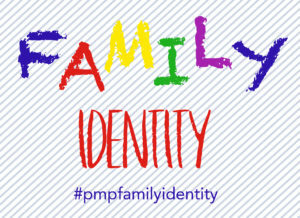 We encourage you to visit Parenting Made Practical’s Instagram to see how families we know are strong in their identity answer that very question!